There has been no shortage of story lines for the Green and Gold this week. Between Aaron Rodgers' concussion, Jermichael Finley's knee injury and the play-calling of Mike McCarthy, you've got enough drama in Green Bay to spawn a reality series. But amidst all the issues, a positive development has fallen through the cracks. Ever since Mike Vick ran all over the Packers, their defensive line has steadily improved. Its a bit of a marvel that they've even done this well when you consider how many reasons they have to fail. Defensive end Johnny Jolly was lost for the year in a suspension for codeine possession. DE Justin Harrell is out for the year. Again. And DE Cullen Jenkins is essentially playing with one hand. His other is a club. Yet Jenkins is second on the team with 4 sacks. Elsewhere on the line, deceptively quick nose tackle BJ Raji has 2.5, and rookie pass rushing DE Mike Neal out of Purdue has one. For a team playing a 3-4 defense supposedly geared towards getting pressure from the outside linebackers by having the linemen take up blockers, the line has generated an impressive amount of pressure. Even in last week's loss, the Redskins were impressed with the Packers D-line. To quote Washington head coach Mike Shannahan, "The defensive line we played against is probably the best in the NFL. If not, I don't want to play the team that has better personnel than they do." That's high praise for a team who not only lost Ryan "I occupy two O-linemen every time" Pickett mid-game, but sports 6th and 7th round picks Jarius Wynn and CJ Wilson as reserves. In fact, its worthwhile to mention just how much of this line was constructed through the draft. Remember the heat Ted Thompson took in 2008? He was criticized for not doing enough to shore up the defensive line, and whiffing when he used draft picks on the likes of Harrell and Mike Montgomery. But in the past two years he's scored big on Raji and Neal in the early rounds, and has in turn silenced his detractors (though recently they've found Marshawn Lynch to latch onto). Though his Best Player Available method can be frustrating to watch as fans, more often than not Thompson proves that he knows what he's doing. 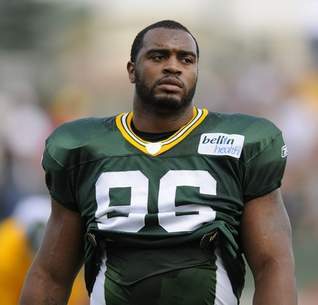 The Raji pick doesn't so much apply to this as Mike Neal. To give you an idea of how high Neal was projected to go, NFL.com had no highlight video available when he came off the board. But he was a classic Thompson pick. Thompson likes to draft what he calls "football players," denoting a player who is more than just an athlete, and Neal is just that. Nicknamed "Bam Bam" because of his ridiculous strength, he is nothing if not dedicated, both to the weight room and the playbook. If you missed it, read Jason Wilde's article on his (lack of) sleeping habits. You get a glimpse of just what Thompson saw in this guy. Indeed, the defensive line is an impressive group made up of impressive players. But, as we zoom back to the wide angle of the Packers season, things still look dire. The mounting injuries on both sides of the ball will be difficult to overcome, and that special Super Bowl aura the team had in the preseason has all but died away. All the same, it's said games are won in the trenches, and on at least one side of the ball it appears the Packers are in very good shape. Looking forward to January 2nd! Raji, Jenkins, Pickett and Neal make for a pretty formidable d-line. Now all they need is a better OLB opposite Matthews. I'm surprised that Kevin Greene hasn't been able to coach up B. Jones any better.